Orchard Hill Residents - lock up your hearts! Pansy Parker and Misty Green are rivals in romance. Each believes she is the town's best matchmaker. Now, they're going to settle the question for once and for all. They're keeping track to see who can make the most matches in a year's time. No heart is safe in Orchard Hill - not even their own. No one in his right mind would want to date salon owner Lily Robinson. Since her messy divorce, she has a chip on her shoulder the size of Mt. Rushmore. However, veterinarian Ian O'Neil can't help considering Lily as a potential girlfriend, even though, she is determined not to let any one get close enough to hurt her again... 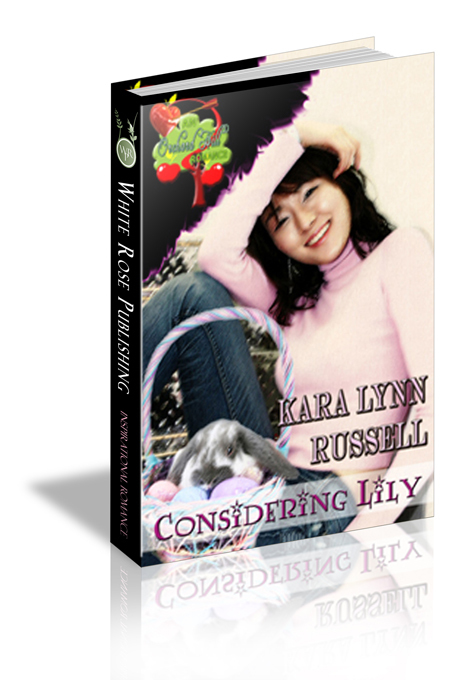 But, with Easter coming, Lily is reminded that the Lord makes all things new, and she wonders if that includes her shattered heart. With Ian's help, can she learn to trust again? Pansy Parker surveyed the disaster area that was her kitchen. When she’d left this morning, it had been pristine. She’d washed the cup, spoon and cereal bowl she’d used, and then put them away before leaving for work. While she was gone, it seemed there had been a tornado in her kitchen. The sink was filled with dishes. The counter had crumbs scattered across it, and the refrigerator was decorated with greasy smudges. “That’s very thoughtful of you,” Pansy said, trying to dredge up appreciation. What were the two of them going to do with a whole cake! Especially one that was made with the whole wheat unbleached flour that Perry had brought home from the grocery store yesterday. “I don’t have to stay here if you don’t want me. I have a little money saved up. It could see me through until I get on my feet. I could be out by the end of the week. Just say the word,” Perry said, and the worst part was, she knew he meant it. He was a good boy, after all. “Do you miss her?” As annoying as living with Perry was, she did love him. An idea sparked in Pansy’s head. “You never know, dear,” she said. She’d find a match for Perry and count it toward the challenge. But who to match him up with? She’d have to think about it. She’d find someone by the time she finished with her current project—Lily Robinson and Ian O’Neil. Consider how the lilies grow. They do not labor or spin. Yet I tell you, not even Solomon in all his splendor was dressed like one of these. She was dancing. A soft, slow song was playing and someone’s arms were around her. Lily looked up and saw his face. It was Ian O’Neil. She knew it would be. The dream was always the same—she and Ian dancing together at the New Year’s Eve dance. That part had actually happened. Lily had avoided things like dances and parties since she’d moved to Orchard Hill, but she’d gone to the New Year’s Eve dance for Grace, her best friend. Grace had been jilted by her fiancé not a month before. Lily thought going out would be good for her. At the dance, Grace had ended up with longtime friend Riley O’Neil and Lily, not wanting to intrude, had asked Riley’s brother Ian to dance. A dance was nothing, she figured. She could handle it. Wrong, wrong, wrong! From the moment Ian had pulled her close, he made her feel special—cherished. That was why she had to avoid him now. Because those were the kind of feelings that led to dependence on someone, and Lily had learned it was better to only depend on yourself. And that’s where the dream ended every time. The stupid dream had kept Lily tossing and turning all night. When she finally drifted off, Lily slept so soundly she didn’t hear the alarm. She came awake some time later, noting the beams of light shining through her curtains. She rolled over to check her clock: 8:30! Lily threw off the covers and jumped out of bed. She was going to be late for church. After a quick shower, she dressed and dried her hair. Even though she ran a beauty salon, and knew how to do all sorts of complicated hair styles, Lily was glad she kept her own dark hair in a simple layered cut. It was easy to deal with on mornings like this. She grabbed a granola bar and was out the door of her small apartment which sat over her shop, Gilding by Lily. It was small but at least it was included in the rent she paid for the shop. She had to watch her pennies. The Orchard Hill Community Church was only a few blocks from her shop. Lily walked there as quickly as she could in heels and a straight skirt. She hurried into the narthex, grabbed a bulletin and slipped into the sanctuary. The congregation was already singing the opening hymn. No time to look for Grace. Luckily there was an empty spot near the back. As she slid into the pew, Lily noticed with annoyance that she was sitting directly behind Ian O’Neil. Just great. It was time for the passing of the peace. Everyone rose and exchanged handshakes or hugs with those around them. Lily shook the hand of the person to the right, and then turned to greet the people behind her. When she turned toward the front again, there was Ian holding out his hand to her. Lily felt her smile freeze upon her face. She couldn’t let him see how she felt about him. She steeled herself for the warmth of his touch when his much larger hand enveloped hers. “Peace be with you,” said Ian solemnly. “God’s peace,” Lily mumbled back. There. That wasn’t so bad. She could handle Dr. Ian O’Neil. With a jolt, Lily realized that everyone was sitting down, and she was still standing there holding Ian’s hand. She snatched her hand from his grasp and sat down quickly, glad she wasn’t prone to blushing. If she were, she’d be beet red right now. As Ian also turned to sit, she noticed a small smile of satisfaction on his lips. It took all her self control to keep from kicking him under the pew. “That we’re getting married,” finished Grace. Riley held up her left hand so everyone could see the sparkling ring she was now wearing. Applause broke out, and those nearest the happy couple offered hugs and hands to shake. Then the organist began to play the postlude hymn and people started gathering their things and filing out of the sanctuary. Lily sat there, stunned. She had no idea things were that serious between Riley and Grace. They’d been dating a little less than two months. Looking up, she saw Ian standing there, towering over her. She stifled a groan, but didn’t protest, not even when he took her arm to help steer her through the throng. In the fellowship hall, there was already a crowd of well-wishers surrounding Grace and Riley. Lily and Ian hung back until most of them had moved away. Then, Lily approached first, holding out her arms to hug her friend. “Once I got her to consider me at all,” added Riley, hinting at Grace’s initial reluctance to date him for fear of ruining their friendship. “Hey, you two,” Grace broke in. “Come to brunch with us. We want to talk to you.